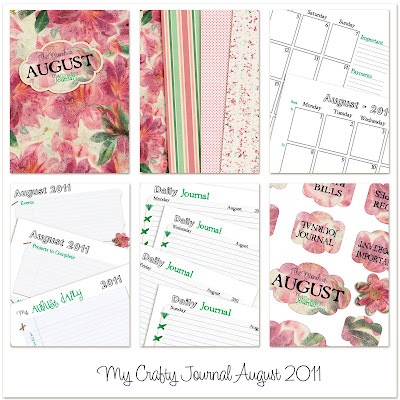 Crafty Queen Blog: August *My Crafty Journal* is ready....despite the coughing and spluttering. August *My Crafty Journal* is ready....despite the coughing and spluttering. I'm so lucky the August set for MY CRAFTY JOURNAL was almost done prior to getting so sick. I have only given this a very quick proof, so I'm seriously keeping my fingers crossed that all is OK. Any problems with the download or August page set please let me know so I can jump on it. Well, probably more of a crawl rather than jump! LOL To grab the PDF printable download for your own personal use simply click on the preview. Have a great August! I'm back to bed. Also, L.O.V.E. your eliminate canvas! Hi Kelli, I'm surprised too at the difference, and I just love the white. I can't wait to get everything back into my shiny new room and organised. Just need to rid myself of this horrible bout of flu which has had a grip of me for more than 3 weeks now. Have fun painting! Love to see some pics.